Changing The Campaign Conversation : NPR Public Editor NPR's second installment of "A Nation Engaged" series highlights trade policy. 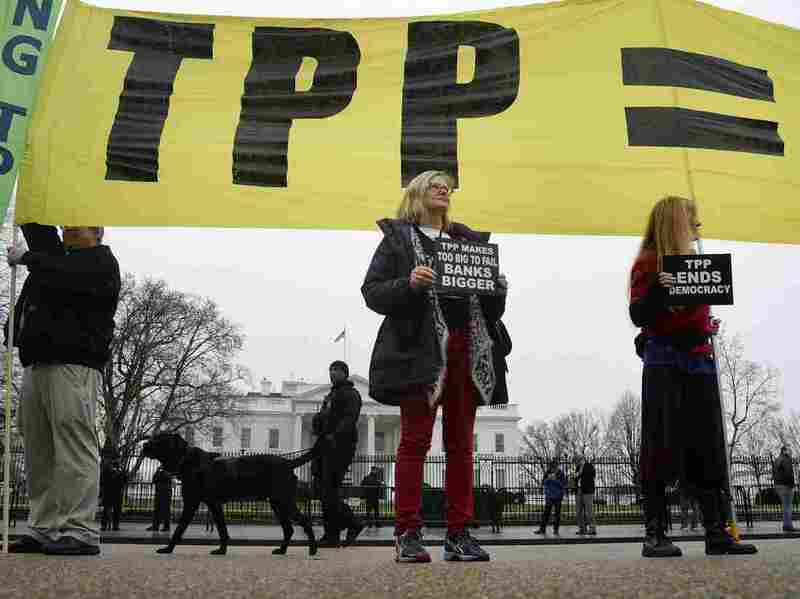 Activists hold a rally to protest the Trans-Pacific Partnership (TPP) in front of the White House in February 2016 in Washington, D.C. In a recent column I suggested that NPR's election coverage would benefit from occasionally stepping back from the day in, day out, "horse race" of the campaign trail, with its focus on who is up or down in the polls and in fundraising, and the latest gaffe or candidate spat. Many listeners in their letters to me say they want much more of a focus on where candidates stand on the issues, and on fact checking. Following that column, Michael Oreskes, NPR's senior vice president of news and editorial director, flagged for me a newsroom project looking at U.S. trade policy and the link to jobs. It began today and is a very welcome NPR effort. Not only does it step back and focus on an issue that many voters (and candidates) have said is important to them, but it also has the potential to bring the public into the conversation in a meaningful way. This is the second installment of the initiative NPR is calling "A Nation Engaged." A pilot week that looked at the anxieties of the U.S. electorate took place in January. Another four or five such topical efforts are envisioned for the rest of the election season. This week's topic was chosen because it had become part of the presidential campaign conversation on both the left and right, Tracy Wahl, executive producer for editorial franchises, told me. "Trade is an easy thing for politicians to play on," she said, despite the fact that causal relations are not as simple as the stump speeches might argue. "It's easy to put out the idea that local jobs are being affected, which is very hard to fact check because so many things can contribute to job loss or an industry in decline," Wahl said. As part of the project, NPR's Marilyn Geewax, a senior business editor and the national economics correspondent for NPR's web site, hosted an advance webinar on the topic for local station newsroom staff members. There is a lot to like about this approach to election coverage. Trade is a topic that is guaranteed to generate emails from listeners, who want many more nuanced views to make it into NPR's coverage, so I am happy to see NPR focus on it. Moreover, at a time when there has been robust debate about the sometimes-competing priorities of NPR and its member stations, the initiative also plays to what should be the strength of public radio: the ability to connect in local communities large and small, and not just on a national level. As Wahl puts it, "Our goal is to not just broadcast in a one-way direction, but really to create a conversation." Oreskes, in remarks he made to the board of the Corporation for Public Broadcasting, called it an effort to "achieve a different tone from the campaign conversations we have all been living through." I will be rooting for the project to meet its own expectations.